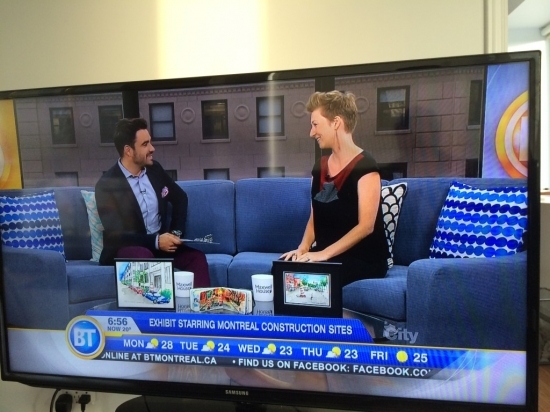 Here is a clip of my interview on Breakfast TV Montreal with . 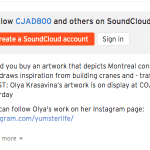 We talked about my fascination with construction sites, orange cones and “Maintenance” exhibit curated by Studio Beluga and Faux Cadres Canal at Galerie C.O.A. It seems like the city as been under construction forever. 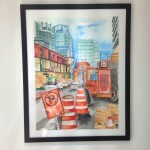 Artist Olya Krasavina’s watercolour paintings depict construction zones and their infamous orange cones! 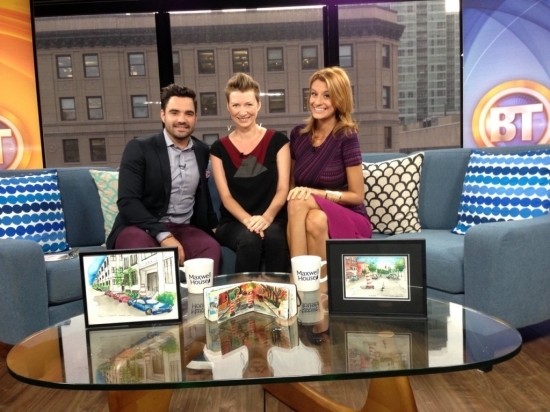 Here is me with the most amazing and cool Alex Despatie and Joanne Vrakas, hosts of BT Montreal. And here is a photo that was taken by my husband from our couch of BT Montreal couch.